The Massive Protests in Egypt against Egyptian President Hosni Mubarak has entered into 9th day on Wednesday and peoples are still on roads in Cairo and other cities of Egypt. on Tuesday over 5 Million people came out on roads to do protest against Hosni Mubarak in different large and small cities. The biggest gathering taken place in Tahrir square of Capital Cairo where over 3 Million where present. After Massive protests in Egypt on Tuesday night the President Hosni Mubarak done a Speech on Egyptian State TV in which he made announcement that Election will take place in Egypt before time and i will also not take part in these elections but i must be allowed to stay as President until than. Hosni Mubarak also refused to leave the Country and said that i will die in Egypt. 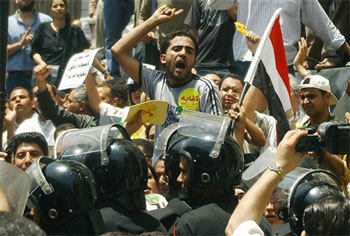 The Protesters has refused the announcement of Mubarak and demanded him to resign Immediately. People raised slogans "We will not go but he will go."